EAF Inc. custom designs and fabricates inspection stations, turntables, tables and customized products for flexible manufacturing cells. Custom Modular T-Slotted Aluminum Inspection Station was designed with a custom slot for the part to lay on top with various components to hang down through the table. 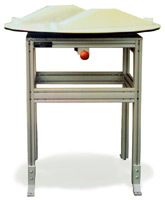 The work surface measures 24"W x 36"L x 28" H.
Inspection Table comes with leveling mounts and lag down base feet. Can be customized to be portable. Heavy Duty Industrial Aluminum Lazy Susan Inspection Rotate Table was custom designed and fabricated to inspect automotive cylinder heads. The nylon machine blocks were machined on 15° angle for ease of inspection. The table rotated 180° by pulling the compression spring lever. 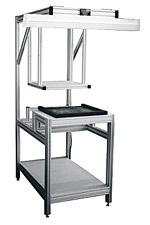 In Line Custom Aluminum Inspection Tables are designed for the conveyor to flow through table. The pallet is pulled onto UHMW work surface and monitor stand is ergonomically located overhead for ease of viewing. Modular T-Slotted Aluminum Inspection Table has a variety of custom features for inspecting a wide variety of industrial and automotive applications. 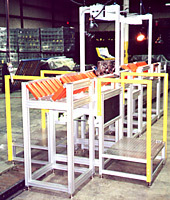 Modular T-Slotted Aluminum Profile Inspection Line was designed to manually inspect automotive engine cylinder heads. Mix and match modules into various inspection processes.